I am appealing the disapproval of Under Lock & Key, July/August 2010 #15 on the grounds of illegal censorship of the First Amendment rights. This is a complaint against Miss Stanback for first not sending me a copy of the First Notice to Inmate of Disapproval and Appeal/Waiver Form dated 7/13/10. I'd also like to file libel information, as K.B. Stanback stated there was no additional appeal rights to this decision to appeal ULK. 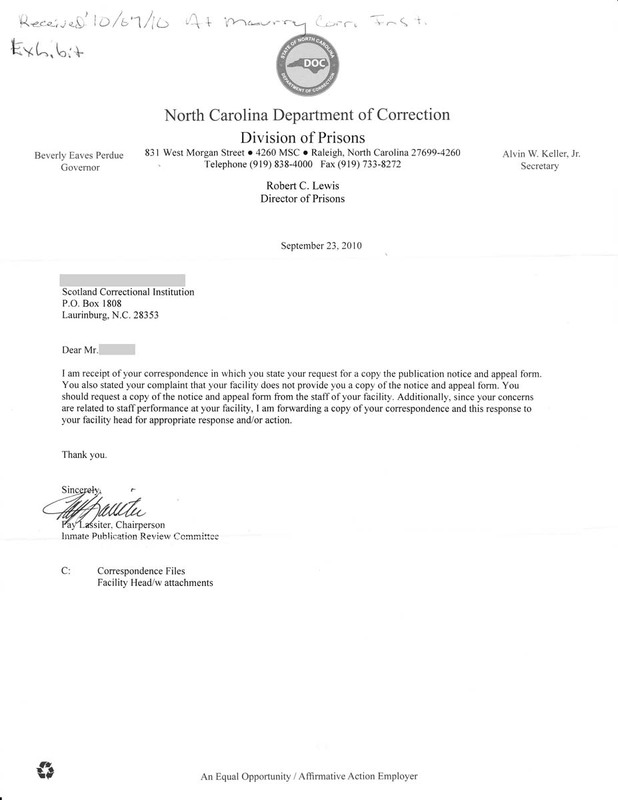 This letter is to inform you of an ongoing problem that MIM Distributors is experiencing with mailroom staff at Scotland Correctional Institution as well as the North Carolina Department of Corrections' Publication Review Committee illegally censoring mail coming from MIM Distributors to prisoners held at Scotland CI. This letter is also to ask for your assistance in resolving this issue. There are three specific instances of censorship that I have outlined below. First, regarding the newsletter Under Lock & Key issue 14 (May/June 2010). At the beginning of July, prisoner AAA was informed by mailroom staff Kristie Stanback that Under Lock & Key has been on the Master List of Disapproved Publications (MLDP) for the past twelve months. AAA had been in regular receipt of ULK as late as April 2010, so he wrote a letter to the Publication Review Committee (PRC) to inform them that Ms. Stanback is misstating the decisions of the PRC. On 22 July 2010 Fay Lassiter, Chair of the PRC responded to AAA's letter saying that Under Lock & Key was added to MLDP on 30 June 2010. However, I have a copy of the MLDP from 25 July 2009 to 25 July 2010 and Under Lock & Key is not included in this list. I have included a copy of Ms. Lassiter 22 July letter as well as the 25 July MLDP for your reference. Is ULK 14 on the MLDP or isn't it? If it is not, then the mailroom staff at Scotland CI as well as the Publication Review Committee are falsely claiming that it is. If it is on the MLDP, then I would like to (1) request a copy of the MLDP that lists ULK 14, (2) receive an explanation as to why ULK 14 is on the MLDP, and (3) appeal that decision to disallow ULK 14 to prisoners held by the North Carolina DOC to a higher authority than Ms. Lassiter. 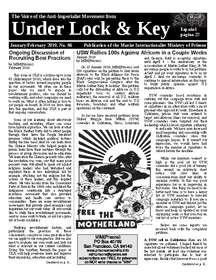 The second issue that I would like to bring to your attention is the censorship of Under Lock & Key issue 15 (July/August 2010). On 27 August 2010, Chairperson Fay Lassiter of the Publication Review Committee sent MIM Distributors a letter saying that ULK 15 was censored because page 4 violates reason "D: Violence, disorder, insurrection and terrorist/gang activities against individuals, groups, organizations, the government or any of its institutions." I have included a copy of Ms. Lassiter's rejection notice as well as page 4 of ULK 15 with this letter. "MIM(Prisons) adds: We do not think armed struggle now is a viable option for obtaining a more just society within the imperialist countries today. Therefore our strategic orientation opposes going up against the state in physical confrontations where we are always outgunned." "[I]t would be irresponsible for us to encourage prisoners to get in fights with guards." "[T]he key [to developing unity] is to start with things that can be done with smaller groups, such as lawsuits and study groups, or actions that require less commitment like petitions or fund drives." On what planet is explicitly encouraging lawsuits and study groups, while explicitly discouraging prisoners assaulting corrections officers considered violating reason "D" stated above? The articles that these MIM(Prisons) analyses are accompanying are not any different, except perhaps even more watered-down to accommodate mailroom policies, than articles that would be found in a newspaper such as the New York Times. However somehow the New York Times failed to make it onto the MLDP. On 10 September 2010 L. Norton informed BBB that ULK 15 was added to the "Disapproved Publication List." I have included a copy of the notice from L. Norton with this letter. Regarding the censorship of Under Lock & Key issue 15 (July/August 2010), I would like to request that (1) my office is sent a copy of the MLDP that lists ULK 15, (2) I receive an explanation as to how page 4 of ULK 15 falls under reason "D" for denial, and (3) if ULK 15 is shown on the MLDP, I would like to appeal this decision to someone higher in authority than Ms. Lassiter based on the argument I provided above. Lastly, I would like to present to you the censorship of a six-page introductory letter from MIM Distributors about the prisoner support organization MIM(Prisons), that was also denied delivery to BBB at Scotland CI. I have included a copy of this introductory letter and the denial for your reference. Mailroom staff Ms. Stanback denied delivery of a "Maoist Internationalist Newspaper" to BBB on 20 July 2010 stating that pages one through four are in violation of reason "D" (outlined above) generally, and specifically pages one through four "encourages [sic] protests against the correctional institutions." "Our current battles in the United $tates are legal ones. We encourage prisoners to join these [legal] battles while explicitly discouraging them from engaging in any violence or illegal acts. 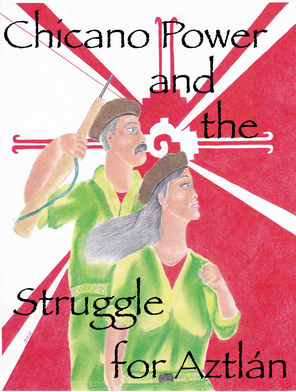 MIM(Prisons) and its publications explicitly oppose the use of armed struggle at this time in the imperialist countries (including the United $tates)." 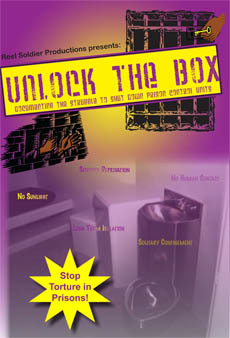 "USW comrades contribute writings about prison conditions to Under Lock & Key, circulate MIM literature within prisons, conduct study groups, and generally take some practical leadership in educating (through strictly legal means) about prisons as an aspect of U.$. imperialism." Clearly, United Struggle from Within and MIM(Prisons) do not encourage protests against the correctional institutions. Ms. Stanback's actions are in direct violation of BBB and MIM(Prisons)'s Constitutional rights to free speech, as well as in opposition to North Carolina DOC's intended policies regarding incoming mail. Therefore, based on Ms. Stanback's history of disregard for these rights and policies, I am requesting that (1) Ms. Stanback is relieved from her position determining the validity of incoming mail in the NCDOC prison system, (2) other mailroom staff at Scotland CI are retrained how to determine whether a piece of mail is acceptable to prisoners held there according to United States law and NC DOC policies, and (3) mail between MIM Distributors and prisoners at Scotland CI is no longer illegally mishandled by mailroom staff. I am aware of the relevant case law that guides prison administrators in maintaining the penological interests of their institutions. However, Ms. Stanback and Ms. Lassiter's actions fall outside of the law in these instances and I believe it is your responsibility to ensure that your staff follow the law. We appreciate your timely response and efforts to resolve this illegal practice. I wrote the Inmate Publication Review Committee (IPRC) on 8/15/10 ahead of time requesting a copy of their IPRC decision once reached concerning the disapproval of Under Lock & Key (ULK) July/August 2010 #15. I appealed Asst. Supr. Miss Kristie B. Stanback's decision for unjustly disapproving the ULK July/August 2010 #15 issue on 8/11/10 and as of today (10/9/10) I have not gotten a copy of the appeal decision, nor have I gotten one single copy of any appeal from the IPRC on staff at the facility Scotland Correctional Institution. It is being censored but I do not believe it's the mailroom. I believe it's prison housing staff who seem to harbor animosity towards Muslims, particularly the ones who are not humble to the pig and their institutionalized corruption.